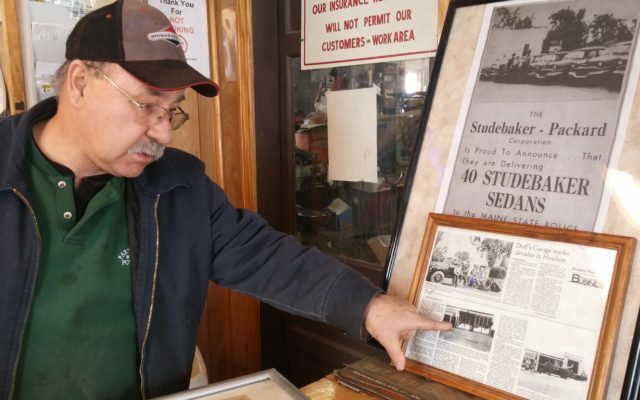 For half a century, Duff’s Service Station has kept the automobiles, lawn mowers and snow blowers of southern Aroostook County folks humming along smoothly. 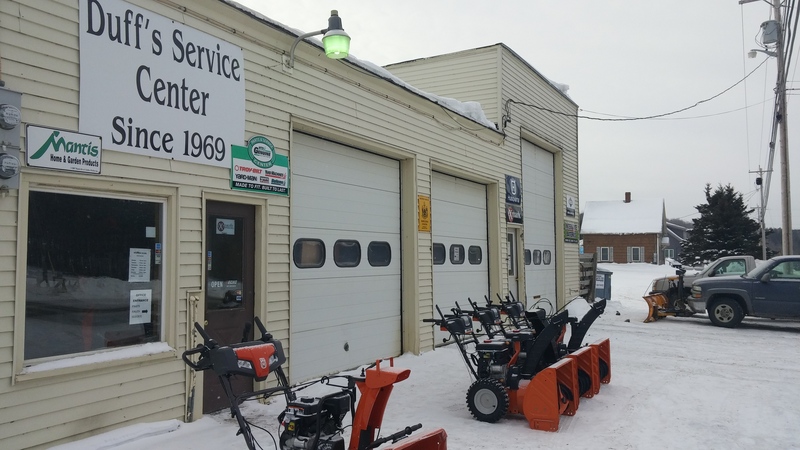 HOULTON, Maine — For half a century, Duff’s Service Station has kept the automobiles, lawn mowers and snow blowers of southern Aroostook County folks humming along smoothly. Located at 306 Bangor St., the business got its start in 1969 when Carl Duff opened Duff’s Garage, complete with gas pumps and a wrecker service. Tom Duff went to work for his father in 1981 and has been at “the garage” ever since. John Cassidy actually started Cassidy’s Service Station back in 1934 and made it a Studebaker and Willy’s dealership in the 1950s. Carl Duff married Cassidy’s daughter, Mildred, and took over the company in 1969. Much has changed over the past 50 years. Carl Duff retired from the business in 2002, with Tom taking over, but Carl could often still be found at the shop chatting with customers up until his death in 2015. In 2009, for the business’ 40th anniversary, the name was changed to Duff’s Service Center with Tom and Ryan handling most of the day-to-day work. The name change was made to streamline their automotive and lawn and garden business. Ryan now resides in Bangor but still plays a major role in the company. Carl and Mildred were married for nearly 65 years and raised six children — Jimmy, Dana, Dale, Carla, Tom and Peter — who all had their place in the business growing up. Jimmy Duff, who now is retired and resides in Alabama with his wife Eloise and family was the first employee Carl hired in 1969 when he was still in high school. Jimmy worked there on and off through the 1970s and often speaks fondly about his experience working with his dad as well. Dana Duff is a retired Houlton police officer and well-known personality in the Houlton area who used to help out at the station when he could. Dale Duff is the sports manager and broadcaster at 92.9 FM The Ticket and resides in Bangor with his wife Nora, but he also worked for his father during his high school and Ricker College days. Carla Duff was instrumental in putting together family events and open houses and helped her mother with the books at times, Ryan said. She currently still lives next door to the business where she has resided for over two decades and works in accounting at Madigan Estates. Peter Duff grew up around the shop and delivered parts and changed a tire every once in a while. He resides with wife Angela and family in Bangor. In 1970, Carl took on Bolens and Yard-Man outdoor power equipment and became a dealer for the brands as he sought another niche to add to the business. “Carl used to say that it was a side thing back then as the automobiles, the 24-hour towing business and the school buses that Duff’s serviced for SAD 70 in Hodgdon and SAD 29 in Houlton through the mid 1990s kept them very busy,” Tom said. The 1970s and 80s saw many triumphs, and a few setbacks, according to Tom. In 1983, the family nearly lost their showroom when a commercial trailer carrying a full sized bulldozer came unhooked from a truck and smashed into the front of the building, causing significant damage. The company also switched from the now-defunct Bolens and Yard-Man line to White Outdoor and Troy-Bilt in the late 1980s. Then there was the recession of 1990-91 that Tom describes as a “very trying” time for the business. “We would see maybe one customer a day for months,” he said. And in 1989, Carl suffered a massive heart attack that knocked him out of commission for a time. “For every setback or hardship though, there were triumphs such as sales awards for Bolens and Yard-Man and the addition of a dozen grandchildren that came along from 1975 through 2003 that always kept the family and Carl and Millie smiling,” Ryan said. More recently, Tom renovated parts of the office and building to keep the business going strong over the past 17 years. He took on new lawn and garden equipment lines over the past decade, switching to Columbia Outdoor Power Equipment and taking on Husqvarna Power Equipment in 2012. He also expanded into zero turn riding mowers, which are the new staple for the lawn and garden industry today, by taking on Exmark in 2009. Tom also expanded the Echo Outdoor handheld line by increasing sales year over year. On the automotive side, new vehicle lifts, diagnostic scanning tools, computers and tire machines and balancers have kept Duff’s up to date with technology and able to still service the demands of today’s vehicles. “I have seen a lot of changes in the past few decades and to be competitive and strong, you just have to roll with the times and invest in the business.,” Tom said. Tom said it’s the daily interaction with people that he enjoys the most. “We have customers and families that we have been servicing and working with for decades and generations and even though some have passed on or moved away, their kids, grandkids, other family and friends still come in,” Tom said. Today, the business uses social media, a website and expanded offerings in parts and accessories for mowers, tractors, chainsaws and other equipment to keep up with the demands of the lawn and garden industry. “You’re always competing with the online guys and retailers, so we always try to keep enough parts on the shelf, so the customers don’t have to go elsewhere,” Tom said. So what does the future hold for Duff’s? That part is unclear as Tom turns 64 this year and is slowly heading toward retirement.